DNA barcoding is a part of the United Nations strategic plan for the enhancement and protection of biodiversity. It was officially introduced as an important DNA sequence-based identification tools for species identification in the Capacity-building Strategy for the Global Taxonomy Initiative at the 11th meeting of the Conference of the Parties (COP 11) held in Hyderabad, India, in 2012. It was further reinforced in decisions at COP 13 and COP14 in the Technical and Scientific Cooperation document related to the implementation of the Strategic Plan for Biodiversity 2011-2020. 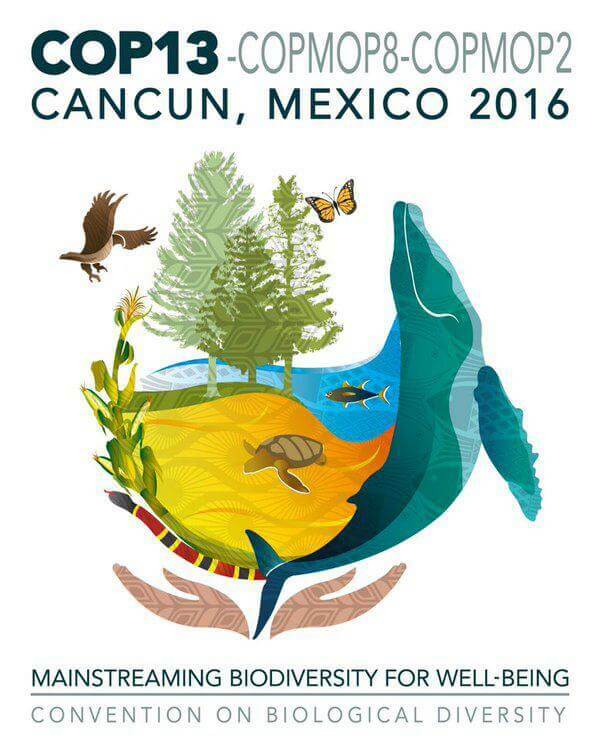 The Thirteenth meeting of the Conference of the Parties (COP 13) was held in Cancun, Mexico, in December 2016.
support the development, with the assistance, as appropriate, of the international barcode of life network, of DNA sequence-based technology (DNA barcoding) and associated DNA barcode reference libraries for priority taxonomic groups of organisms, to promote the application of these techniques for the conservation and sustainable use of biodiversity, and to support related capacity-building activities, including relevant academic training, as appropriate, further to the Strategic Actions 3 and 4 of the capacity-building strategy for the Global Taxonomy Initiative. The Fourteenth meeting of the Conference of the Parties (COP 14) was held in Sharm El-Sheikh, Egypt, 17 – 29 November 2018.
promote and facilitate training in DNA technologies, such as DNA barcoding for rapid species identification. Read more about how DNA barcoding technology was discussed as an invaluable tool for global biodiversity conservation at COP14. The Centre for Biodiversity Genomics (CBD) at the University of Guelph initiated the DNA Barcoding Research Training Program in 2014. The program offers a comprehensive four-week immersion into standard methods and operational workflows for biodiversity professionals, tailored to participant’s needs and their institution’s analytical capacity. Since 2014, 54 trainees from 33 countries have been hosted with 38 participants being sponsored through third-party contracts and 16 being self-funded. In 2015, CBG and CBD began a collaboration on “train the trainer” projects that were aimed at building capacity on the application of DNA-based technologies for the identification of priority species such as invasive alien species, endangered species, endemic species or species of economic importance. This collaboration was built as part of the Global Taxonomy Initiative (GTI) with financial support from the Government of Japan through the Japan Biodiversity Fund. Map indicating the 33 countries involved in training at the Centre for Biodiversity Genomics. 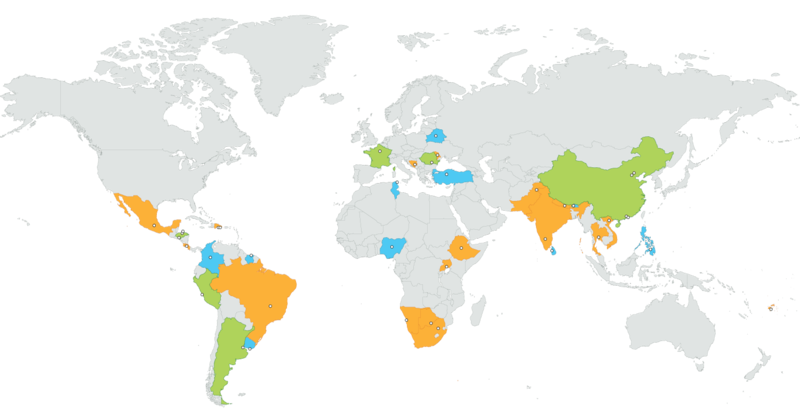 The 27 countries involved in Phase I of the GTI Training course are indicated in orange while the 10 countries involved in Phase II are highlighted in blue. Provided support for the GTI Training Course on Rapid Identification on Invasive Alien Species for Achieving Aichi Target 9. A total of 51 early career researchers from developing countries took the online course “Introduction to DNA barcoding” and about half of them (28 participants from 27 countries) received in-depth one-month hands-on training at CBG. Provided support for the GTI project “Filling Capacity Gap for Application of DNA Technologies in Taxonomy Driven by the Trained Trainers and Relevant Networks in Developing Countries”. Ten ‘trained trainers’ were selected to organize hands-on training courses in their countries with the end goal of implementing DNA-based technologies for rapid identification of priority species as identified by their respective National Biodiversity Strategy and Action Plans. © Copyright 2019 International Barcode of Life Consortium. All Rights Reserved.